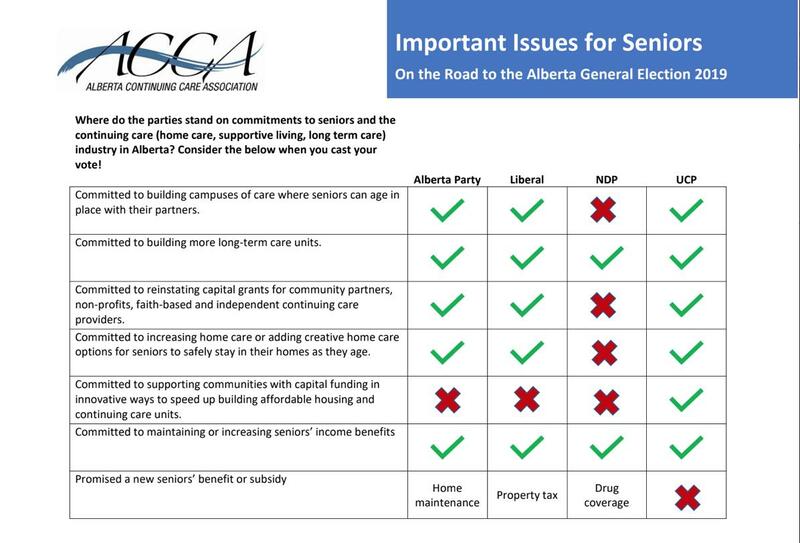 A "reference document" implying that residents of seniors' care facilities and their families should vote for the United Conservative Party has been distributed by the Alberta Continuing Care Association. In addition to creating the misleading impression the UCP is more committed to creating housing for seniors than the NDP, the colourful one-page infographic from the care facility owners' and operators' association seems clearly designed to make the NDP government look bad. Using visual cues and loaded language, the document, titled "Important Issues for Seniors," implies the NDP is not committed to building more seniors' care, and says the party lacks enthusiasm for "creative home care" and "innovative ways to speed up building" (euphemisms for privatization and P3s), suggesting that's evidence of the same thing. The column on the image describing UCP policies shows a long list of bright green check marks. The NDP column is mostly large dark red X marks. The material in the document is not the same as more detailed information that appears on the ACCA's public website. 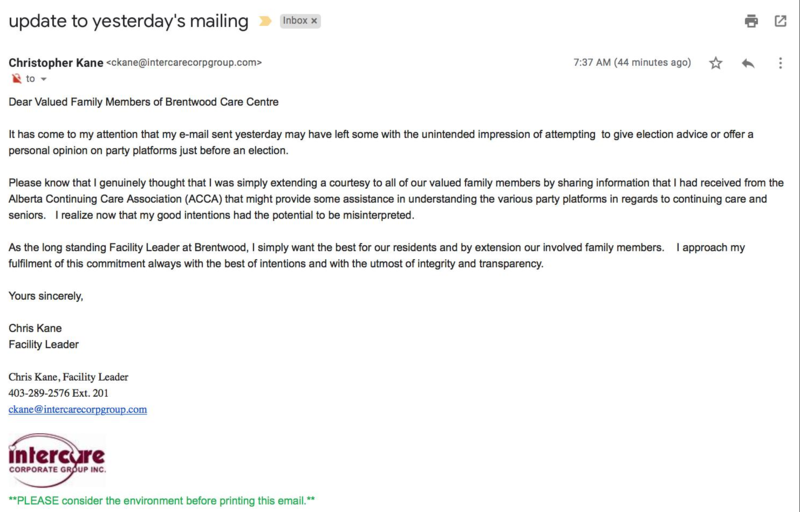 In addition to drawing attention to the ACCA infographic, an email sent Friday to the families of residents of a private, for-profit Calgary care facility -- where residents include patients suffering from advanced dementia -- reminded them their loved ones can vote at the facility on Tuesday. 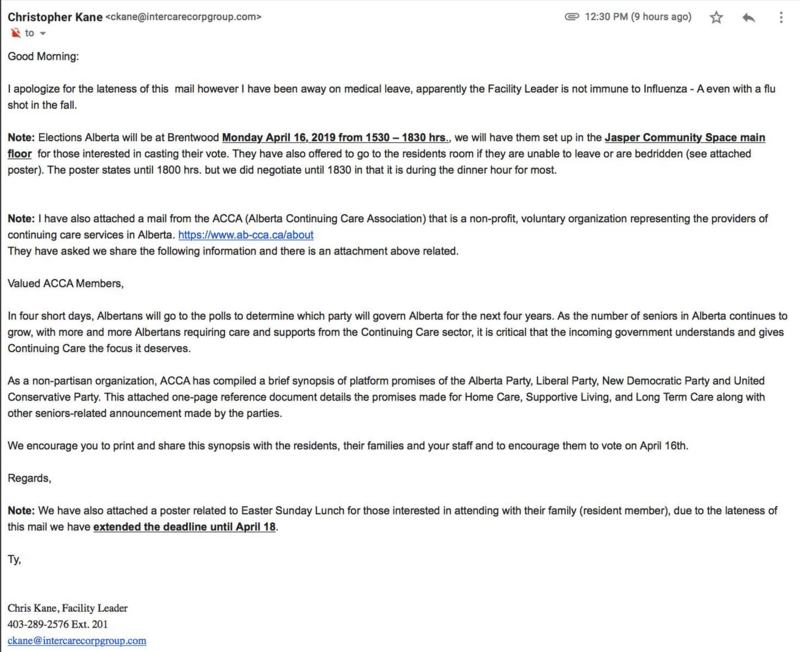 "In four short days, Albertans will go to the polls to determine which party will govern Alberta for the next four years," the email from the Facility Leader at Intercare Corporate Group Inc.'s Brentwood Care Centre in Calgary said in part, quoting from an email he had received from the ACCA. "We encourage you to print and share this synopsis with the residents, their families and your staff and to encourage them to vote on April 16th," the note says. The inference is clear that residents, families and staff should be encouraged to vote for the UCP. Arguably, this is an interesting approach from an organization of private, for-profit and not-for-profit care organizations that receive public funds to operate their facilities. One wonders what the operators might seek from the UCP in return for this effort. The chair and five of the six directors of the ACCA board come from private-sector care providers. One is from a non-for-profit care provider. ACCA membership also includes a "corporate members" category, that welcomes insurance companies, food services corporations, and construction and maintenance contractors, among others. Some family members were concerned their relatives with severe dementia would be encouraged to cast a ballot for the UCP, the implications of which they are no longer capable of understanding. Perhaps as a result, the facility manager followed up with a second email yesterday morning saying it had come to his attention Friday's email "may have left some with the unintended impression of attempting to give voting advice or offering a personal opinion on party platforms just before an election." On the contrary, he said, he was simply sharing information received from the ACCA "that might provide some assistance in understanding the various party platforms in regards to continuing care and seniors." For many families, "affordable seniors' housing" financed in "innovative ways" is a more costly alternative to publicly funded spaces, which are limited in number and therefore difficult for most Albertans to access for their loved ones. The private sector alternatives offered by ACCA members can cost thousands of dollars per month, of which only a small portion is counted as tax-deductible health care. So residents and their families can be on the hook for $7,000 or more a month for meals and accommodation provided by "independent continuing care providers." It is not known if this document was distributed by all facilities owned or operated by ACCA members. In all likelihood, this will be shrugged off by media and, of course, the UCP. But imagine the brouhaha that would have erupted if a similar document favouring the NDP had been distributed by staff in a publicly owned and operated facility!